Jason Logue is an Australian Army Information Operations specialist. The views expressed here are his own and do not reflect those of the Australian Army, Australian Department of Defence or the Australian Government. Narrative has become a buzzword as leaders, civilian and military alike, attempt to create an enduring ‘story’ to set the framework through which operations are undertaken. The rise of Daesh and its embrace of communications technology to send its message to a global audience has many organisations rethinking their approach. Narrative has become a buzzword as leaders, civilian and military alike, attempt to create an enduring ‘story’ to set the framework through which operations are undertaken. That we are still focused on creating our narrative six-months into this operation perhaps highlights that Kilcullen’s observation was not as widely disseminated as his book-sale figures would have us believe. So what is a narrative? The rise in popularity of the term ‘narrative’ during past 12 months has directly coincided with an increased misunderstanding of what it actually means. Like the ‘StratCom’ era of 2004 onwards, ‘narrative’ has become a corporate buzzword that has multiple meanings depending on who is using it. Some use narrative as a euphemism for talking points around a single issue, incident or event. Others use narrative as a kinder, gentler, word for adversary propaganda. A small group segment out narrative by dissemination method. Some believe a narrative is one-time core statement while others approach it as an ever-evolving story arc. There are those that even confuse narrative for strategy. In reality a narrative is much simpler than this. Unfortunately that simplicity does not mean that generating and sustaining it is easy. …a narrative describes the current state, what the proposed future state will look like and justifies the actions needed to get there. A narrative provides the compelling foundation for communication efforts, not the communication effort itself. A narrative is a simple, credible and overall representation of a conceptual ideal designed to convey the organisation’s self-concept, values, rationale, legitimacy, moral basis and vision. A narrative informs and educates internal and external audiences and therefore is ‘translated’ in a cultural and attuned manner. It is the common reference point that should guide the development of all plans — communication and manoeuvre. In even simpler terms, a narrative describes the current state, what the proposed future state will look like and justifies the actions needed to get there. In military terms it sets the left and right limit of arc. A key feature of narratives is that there is always more than one in circulation and in most cases they are competing for acceptance among similar target audiences. The pervasiveness of a narrative then becomes crucial if it is to act as a framework for follow-on communication activities and to support planning. Military planners seek to generate and sustain the ‘dominant narrative’ — the fundamental story or perception that has been established as valid in the minds of members of one or more target audiences — to support both strategy and operations. Moreover it is here that the struggle in creating an effective narrative plays out. In a modern democracy, narratives are genuinely political in nature, particularly immediately prior to, or early in conflict, and then again at its conclusion. Given the truism that all politics is local, early crafted attempts at a narrative are often focused almost solely on one target audience — the political party’s support base. This focus, while absolutely important to those making the difficult decision to commit national blood and treasure to a conflict, limits the narrative’s ability to meet the demands of the military or interagency force tasked with executing the assigned mission. Therefore an appropriate narrative must focus on more than one target audience. In the current Iraq conflict these target audiences include our own domestic populations, the Iraq population with its myriad ethnic, cultural and sectarian boundaries, coalition partners, regional nations impacted by the ongoing fighting and of course, the personnel we send into harm’s way. Importantly, the narrative must also address our adversary, the Daesh themselves and those disillusioned young men and women who are recruited from across the world by a false promise. A narrative that is so aspirational that it is unrealistic, has failed before it is published. The difficulty is that to be pervasive, a narrative must be something that is easily digested, no more than 200–300 words, and the complexity of modern conflict as is playing out in Iraq makes a simple explanation difficult. A good narrative does one of two things. It can unseat an existing or competing narrative by offering an attractive alternative or, it can assist in adding so much complexity to the adversary’s narrative that it loses its appeal. A good narrative provides the framework for a range of communication efforts, not the exact text of all communication efforts as some would like. A narrative has to be credible and that means incorporating some aspects that many would prefer were left unstated. In a recent essay, The Islamic State Through the Looking Glass, authors Peter Harling and Sarah Birke posited that the West has a tendency to “use vocabulary that is designed to be reassuring rather than true.” A poorly formed narrative can be easily critiqued, ridiculed and countered. A narrative that is so aspirational that it is unrealistic, has failed before it is published. An effective narrative to support operations should include some hard truths about how the situation requiring military intervention has arisen, even if that means recognising that previous forays may have contributed to the current crisis. In addition to the myriad difficulties in developing a good narrative one requirement must underpin the process. Developing a useful narrative means taking a stand and that in turn requires understanding and accepting risk. It means that an organisation will have to publicly declare an alternative future that may not be acceptable to all. In some case the narrative will be required to directly disparage the future offered by the adversary. In development, identifying friction points and being prepared to exploit or mitigate them is crucial. The alternative approach of sanitising the narrative to the point that no one can find fault, defeats the purpose. A narrative is an item in which the immutable truths of a country, an organisation or an individual are proffered. This is perhaps the most difficult aspect in the complex operations the world currently finds itself in. Many ask how Australia, a multicultural, yet predominantly Christian nation, can effectively comment on the validity of Daesh’s interpretation of Islam? Daesh consistently argues that the model of faith they follow is the sole true interpretation of Islam. If we understand and decide that the brand of Islam Daesh propagates is extremist and negatively impacts our goals, we should be including aspects to directly counter our adversary. Not addressing the core elements of an adversary’s narrative leaves little room for a compelling alternative. Sometimes the ‘elephant in the room’ is an essential element of a counter-narrative. Thankfully, there are numerous Muslim scholars around the world who are equally disturbed by the perversion of the Islamic faith propagated by Daesh. The narrative is a living, breathing beast that must be adjusted as the campaign moves through its phases. A narrative must be almost blunt in its simple use of language in order to ensure that when translated, its core principles survive. Blunt language, is of course, an anathema to bureaucracies and politicians and it is here that most issues arise. Similarly, the narrative must define what right looks like. It needs to be so prescriptive that the ‘promise’ of our narrative is something that can be observed and understood by all. Committing to a definitive outcome, against which actions and efforts can be measured and judged, is also a difficult concept. The narrative is a living, breathing beast that must be adjusted as the campaign moves through its phases. It needs to continually re-justify the actions needed to get towards the proposed future state — the promise we offer all. The narrative has to be more than just a statement of facts arrayed to tell a story. It must offer a promise, a covenant between us and those who the narrative is directed at. It must invoke an emotional response because it becomes that basis from which targeted communication efforts designed to persuade and influence specific groups and individuals are based. Emotion is key in story telling and is crucial in gaining acceptance among target audiences. Rhetorical techniques are crucial in sustaining the argument for the proposed future state. The narrative needs to invoke the appropriate levels of support for putting personnel in harm’s way, for taking the lives of those who oppose us and, if required, a justification for destruction on a wholesale scale. Just restating facts will not achieve this. A good narrative is a psychological tool to generate and sustain support for our own cause and also to fracture support for our adversary. Narratives must be based in reality. If our contribution is niche it needs to explain how that effort will support wider aims rather than attempting to frame campaign success as achievable by our efforts alone. If our participation has significant constraints, they should be acknowledged. If the outcome we seek is space for a partner to regroup and recommit to defending their population it should be stated rather than focusing on achieving world peace. A good narrative is not a series of jingoistic statements but instead, carefully considers the limitations inherent in our current contribution. Six months into operations in Iraq a number of possible narrative elements have arisen that were not fully obvious when forces deployed last year. The rise of ethno-religious militia groups and their centrality to security operations, the expansion of the conflict into countries beyond Iraq and Syria and of course the seemingly never-ending ways Daesh members have found to impose their brutality on people. These aspects highlight that a good narrative can’t be static. It must adjust with events as they unfold and in some ways should be pushed into action pre-emptively. Waiting for absolutely surety provides our adversary with the opportunity to impose and expand the reach and of his own dominant narrative. Iraqi Security Forces have not been able to stop the spread of this disease by themselves despite efforts to enhance their capability in the previous decade. The Coalition, including Australia, has an irrefutable moral responsibility to support the Iraqi government in advancing its policies for a safe, inclusive and prosperous future. The people of Iraq, the Middle East region and the world need and deserve a stable, functioning and responsible Iraq, led by an inclusive Government. 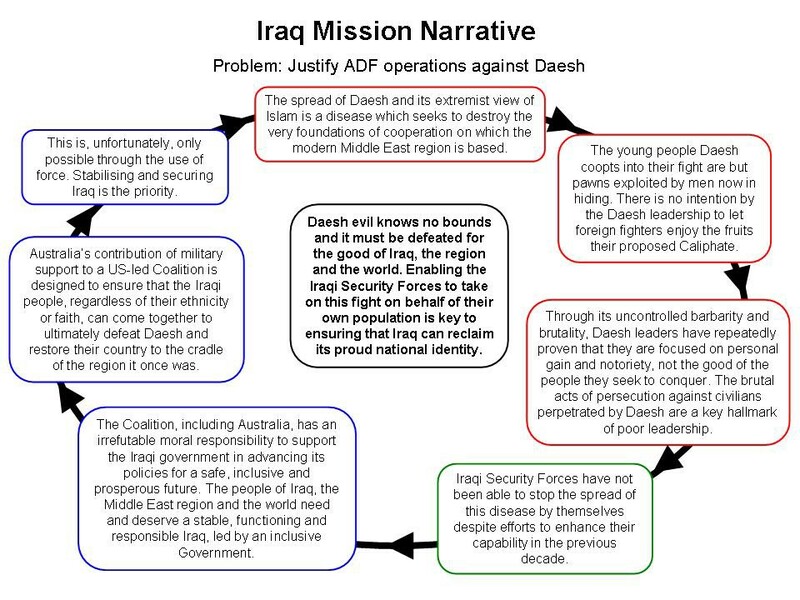 Australia’s contribution of military support to a US-led Coalition is designed to ensure that the Iraqi people, regardless of their ethnicity or faith, can come together to ultimately defeat Daesh and restore their country to the cradle of the region it once was. This is, unfortunately, only possible through the use of force. Stabilising and securing Iraq is the priority. Have a response or an idea for your own article? Follow the logo below to join The Bridge team.